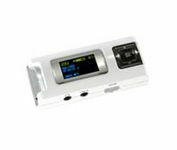 The Microtek MF-202 is a small and stylish MP3 player that is big on features. It has a bright yellow-and-blue OLED display with 128-64 resolution that makes navigating the intuitive user interface or viewing ID3 information a pleasure. With a built-in FM radio and 20 station presets, the MF-202 is not just an MP3 player. You can even record from FM radio, an integrated microphone, and line-in audio sources. 128MB of internal flash memory as well as compatibility with SD/MMC memory cards complete this powerful player.